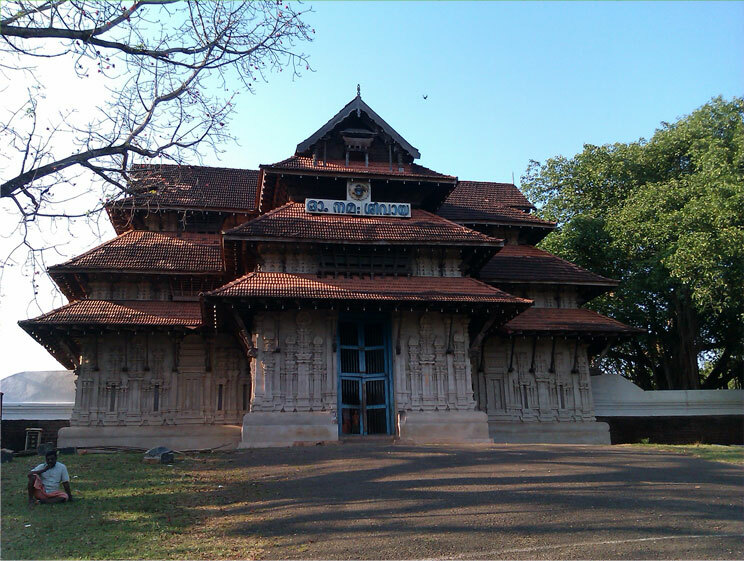 Vadakkumnatha temple is located in Thrissur district. The deity here is Lord Shiva and is one of the oldest temples in Kerala. This temple is believed to be around 2000 years old. The total area on which the temple is located is around 9 acres. The temple structure has 4 gopurams each facing the 4 directions- north, east, west and south. These gopurams are beautifully carved in stone and wood. The walls of the temple are decorated with mural paintings that have themes from Mahabharata. This temple is very famous as the famous festival Thrissur Pooram is conducted from here. The idol of Lord Shiva is in the form of Shivalingam and is always covered with ghee that is accumulated due to the abhishekam done over the years. So the idol is not visible properly. A person can see a 16 foot high heap of ghee covered with gold and three serpent hoods above. This ghee is never removed and it is made this way due to the traditional belief that it represents the snow covered mountains of Kailas. It is said that even though the ghee has been accumulated for years, it does not produce any foul smell nor does it melt at any time. It is said that the ghee is around 1000 years old. If at any time, a portion of the ghee collapses it is considered as an evil sign. Around 7 years back, a portion of the ghee was collapsed and that year during the Pooram festival, an accident occurred during firework which took the life of three. The people can offer ghee for the Abhishekam and a portion is retuned back to the devotee and is believed to have medicinal powers. In the middle of the temple is the Nalambalam with three shrines each of Shiva, Shankaranarayana and Sri Rama. Besides these, there are idols of Ganapathi, Parvathi , Krishna, Parasurama etc. The shrine of Shiva faces west while that of Parvathi faces the east. Offering of Appam to Ganapathi is an important offering in this temple. Aanayoottu is conducted annually on the first of Malayalam month Karkidakam . Once in 4 years Gajapooja is also held. Another ritual that is performed annually is the Ashta Dravya Maha Ganapathy Homam. The Thrissur Pooram is conducted in the Malayalam month Medam that falls in the months April / May and lasts for 2 days. The two main temples that participate in this festival are Thiruvambady and Paramekkavu temples. Each temple has 15 elephants each and the main idol of these temples is kept on top of the main elephant. An attraction of this festival is the 2 hour ‘Elanjitharamelam’. For this festival 50 caparisoned elephants come for procession. They position face to face which is called as ‘Koodikazhcha’ which is then followed by the ‘Kudamaattam’. The fireworks during this festival are world famous. During the festival the temple ground will be filled with millions of people. The next day morning is the ‘Pakal Pooram’ which is the day time Pooram. Fireworks are done this day also. Maha shivarathri is another major festival. In this temple, the idol is not taken out for procession and is the only temple in Kerala in which the idol has not come out for over centuries. This temple has been honored by the Union government as a National Monument. There is a Koothambalam here where the art form Koothu is performed. It is said to be the largest in Kerala and is constructed around 120 years back.